Welcome In Jordan | Stoat – Where? Like many westerners my age, an upbringing on stories of Lockerbie, Ayatollah Khomenei and the PLO, not to mention the media’s relentless obsession with Al Qaeda, has left me with an unwanted and unwarranted low grade reflexive fear of Arabic people. I try hard to suppress this irrational response, casually lumping millions of peace-loving and friendly people, as diverse as Europeans, into a homogenous group of terrorists, but it is a constant struggle against a wave of negative reporting. In fact, I can barely remember a single positive news item I’ve ever seen about the Middle East; they must exist of course, but have been swamped in the deluge of tribal warfare, establishment of a new Caliphate, lack of women’s rights and Islamic Jihad. We fear what we do not know. Despite a keen interest in world news, history and current affairs, the single thing I reliably know about Jordan is that there has recently been some unrest here. When I ask the manager of our guesthouse in Amman about this, his response is simple: You’ve had unrest in the UK too, recently, right? Protests about… government cuts, was it? Demonstrations and marches? Touché. Tourism has suffered greatly in Jordan recently because of the troubles in neighbouring countries. I wonder if anyone has seriously considered not going to Paris at the moment because there have been demonstrations in London? A quick test – call and response. Read the name and think of the first person that pops into your head. Ready? Achmed. Anwar. Khaled. Abu Zaid. How did you do? I got Achmed the Dead Terrorist, Anwar, the drug-munching kid from Skins, Khalid Sheikh Mohammed, uber-terrorist and Abu Hamza, an intolerant Islamic cleric from London (which doesn’t even sound like Abu Zaid!). Now try again. Jamie. Emily. Ahmed, Anwar, Khaled and Abu Zaid were the first people we met in Jordan. Abu Zaid met us at the airport, greeting us warmly with the soon-to-be familiar Welcome in Jordan and firmly rejecting any apologies despite me getting the arrival time wrong and him having waited more than an hour. He drove us into town past shepherds driving their sheep down the lanes. Ahmed worked in the guest house and pointed out the best places to eat, deadpanning: See you later. If you come back alive. Anwar works for the International Red Cross. The restaurant we went to was popular and full. Anwar welcomed us to his table and shared his food while ours was prepared. Khaled is our taxi driver for tomorrow’s trip to Jerash, and he has given us a number for tours in Wadi Rum and told us fair prices for everything from bus rides, to food, to taxi fares and accommodation. Welcome in Jordan. I came to Jordan primarily to see Petra, but I am determined to also find the people. 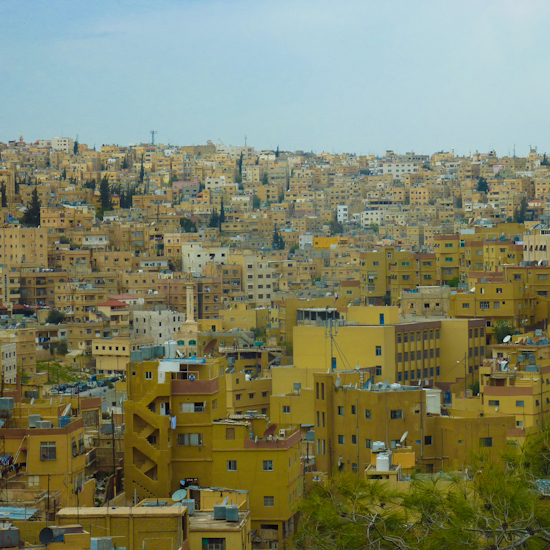 Amman itself is a densely packed city, built in and around seven close hills. Pale, flat-roofed houses clinging to orange hillsides like haphazardly stacked Duplo blocks. Masses of satellite dishes all oriented to entertainment Mecca. Calls to worship at various times of day from towering minarets echo through the valleys, reflected and reverberated, building to a powerful and beguiling crescendo. Above all this sits The Citadel, a complex of ancient ruins which offers panoramic views of the city. 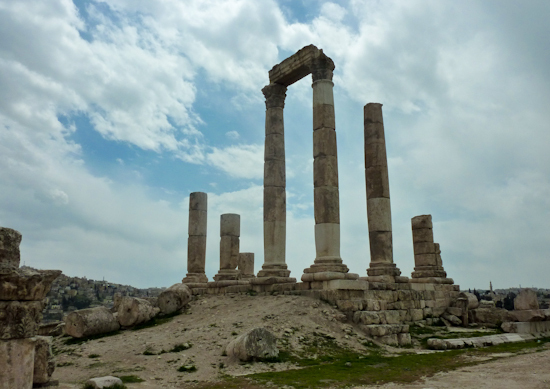 Amman was variously part of the Roman, Byzantine and Ottoman empires and each has left its mark on this place. 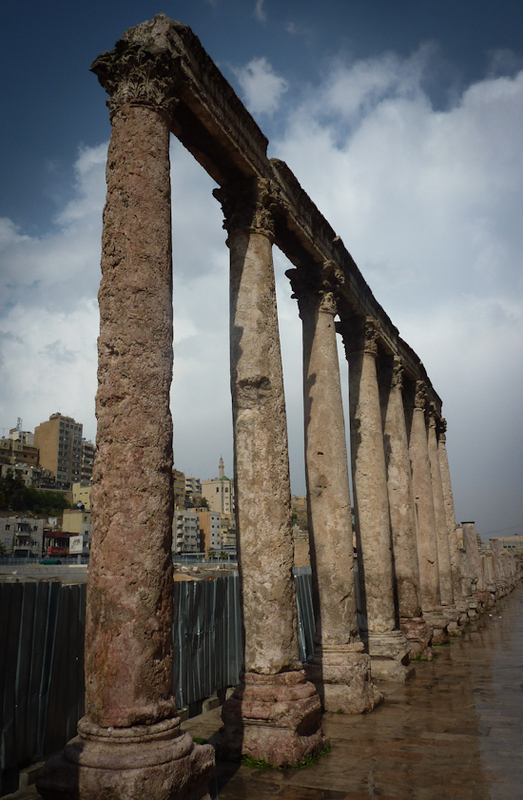 The ruins of Byzantine churches stand next to Roman ruins and the Temple of Hercules. A beautiful blue-domed mosque sits in the middle. 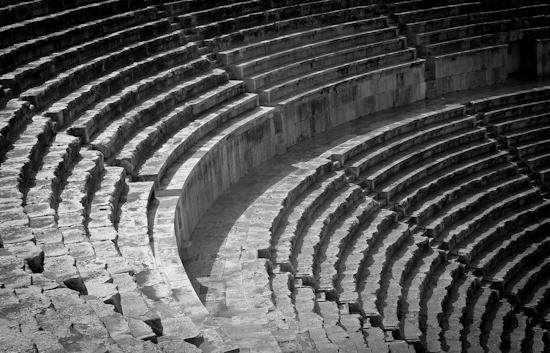 Below, the largest Roman amphitheatre in Jordan, seating in its heyday 6000 spectators. In the evening we head to Al-Rinbow street, getting slightly lost and being escorted by two young men. Welcome in Jordan. We sit at a coffee shop, order some food and observe Amman’s nightlife. Understated, but present. Teenagers in jeans and hoodies against the cold. Some women with headscarfs, some without. The occasional burqa, but by no means prevalent. A focus on talking and coffee. The sweet smell of shisha smoke from elaborate and ornate pipes, curling into the air and combining to form a fruit-salad flavoured fug. Tomorrow, we head to Umm Qais, Ajloun and Jerash to see more historical treasures and then to Petra. There is much to see and little time.